t*rexes and tiaras: Friday Favourites 114.. Ever feel as though your week would be better with just a little more...sparkle? 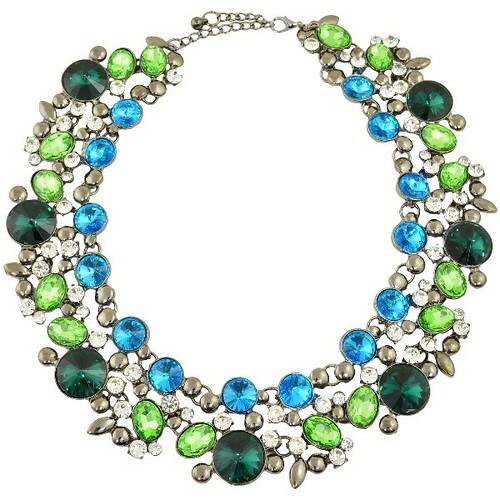 001: I love the colours on this necklace and the fact that the jewels go all the way round, like a proper collar. I think it would finish off just about any outfit to give it that little extra detail. I've not ordered from Chelsea Doll for a while, but have always found them very helpful and their deliveries very speedy in the past. 002: I know, I have a sequin jacket. Or three. But this one has been saved in my favourites for an age. It's sparkly, yes. But it's also floral. And dark-coloured which I think makes it more wintry. Is it a jacket, is it a bolero, is it a coat? It's some kind of sequin hybrid, which I think I could find a place for in my wardrobe for sure. Are you all about the sparkles, as well? i'm always convinced they make me look frumpy as well, tbh!